He has dedicated his life's work to indigenous peoples and their land rights. He counts conservation among his passions as well—though, at times, the two have come into sobering conflict. With GIS, however, he has ironed out some of those wrinkles and produced extraordinarily innovative work on indigenous communities' landholdings and histories. "The whole story begins with indigenous peoples," he said. This is true both around the globe and on a personal level for Smith. "I ended up on the eastern side of the Andes in a small, originally German settlement, working in a land reform office in that town," he recalled. "One of the cases that I got involved in almost immediately was a big conflict between a community of indigenous peoples…and the Catholic Church." To see if he could be of more help, Smith enrolled in a PhD program in anthropology at Cornell University under the tutelage of John Murra, one of the pioneers of Andean anthropology. After completing his coursework, Smith returned to Peru to do his thesis with the Yanesha people—specifically, on their oral history, social relations, and how they use music to understand cosmovisión (how Mesoamerican peoples perceive and interact with time and space). 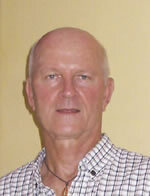 He also continued to work on land issues, helping to get a law passed that recognized indigenous peoples' land rights. During this time, Smith discovered the Yanesha peoples' remarkable vision of their landscapes. "They have this incredible system of epic narratives, each narrative having 10, 20, 30, 50, 100 chapters—all depending on memory and passed on orally," Smith said. "This was actually history that they were talking about—past leaders who had gained incredible importance in their lives, incredible powers," he continued. "I began realizing that these epic narratives were all related to landscape, and that these place-names were markers of where certain things in this oral history took place." "It was an epiphany for me," he said. "That was my dream!" GIS was exactly what Smith had been looking for: a repository for the Yanesha people's place-names, landscapes, and oral histories. A project that he continues to work on today, it is beginning to revolutionize how the world views the role of Amazonian cultures in ancient civilization. "It's the folks at the very local level who most truly understand what's going on and what needs to happen," reflected Convis. Contrary to what many people think, indigenous peoples are not the adversaries of conservation. They understand how nature works in ways that others don't. "He speaks from a depth of experience that's not common," said Convis. "We could begin showing the conflicts between indigenous lands and mining concessions or petroleum concessions or even conservation areas established on top of them," he said. "That was kind of a revolutionary moment here in Peru, when people could begin to visualize those kinds of conflicted relationships." "It's not easy to get mapping groups to come together, partly because people are so protective of their information," Smith said. "As far as I know, we are the only regional mapping group in the world that's stuck together." In subsequent meetings, the idea stuck. 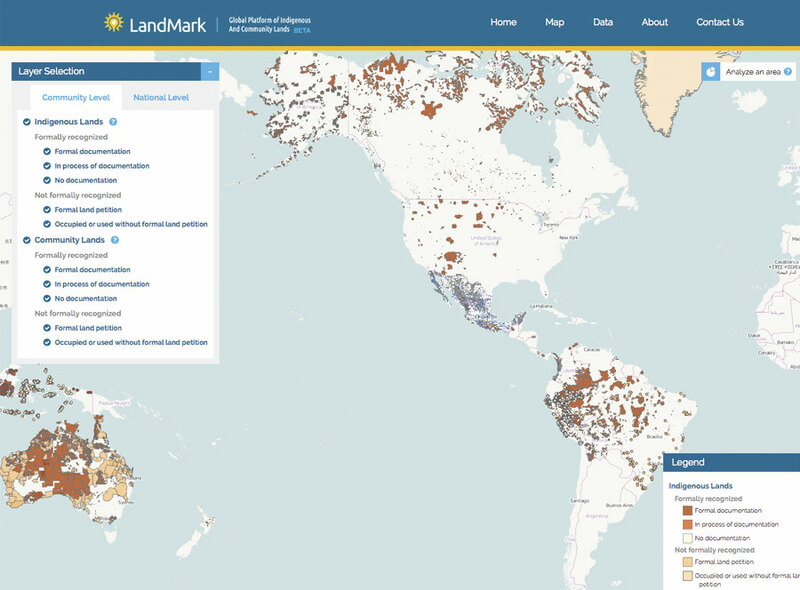 And after two years of vigorous work with a number of international partners to gather information on indigenous and nomadic land claims and uses, the group launched LandMark in November 2015. The interactive map shows data at two different levels. 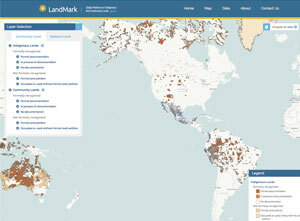 First, there are detailed shapefiles of indigenous and community lands. Second, there is country-level data, which shows the percentage of each nation's landmass that is under some kind of community or indigenous control, as well as an index that details each country's laws about land rights for indigenous peoples and/or communities. "It's a work in progress, and it's going to be a work in progress for years to come," acknowledged Smith. "We push for recognition of communal landholdings not so much to preserve the past but to give security for a future," said Smith. "All of our future."